There's a significant buzz within the local media given that Sri Lanka, after England's stirring reclaiming of the Ashes, sit pretty at the second spot in the Test world. But Kumar Sangakkara, the Sri Lankan captain, is having none of it. When asked the question whether Sri Lanka's possible ascent was an added incentive, Sangakkara had the look of a man who was fed up of the question but he hid it well. "The easiest thing is to get somewhere; the harder is to stay there," he said. "The No. 2 position probably reflects how well we are playing but also says that we are second best, and that means we have a lot more to achieve to get where we want to be." His comments come with Australia slipping to No. 4 in the ICC rankings and their rivals fighting to climb all over them. The situation, based on form and the success the hosts have at the fortress known as the SSC, favours of Sri Lanka celebrating their promotion with another home series win. Leading the series and in search of 2-0, Sangakkara said there was no need to motivate the side. "We're a good self-motivating team. The players take a lot of individual pride in their performances. Not just winning, but playing in the right spirit. We have been very good examples over the years and we're continuing to do that." While admitting his team wears the ''favourites'' tag comfortably, Sangakkara expected a tough response from New Zealand. "I think they are going to come back very strongly and try to win this Test, so that they have something to take back home. We are going all out to win this game and win the series." Replying to criticism of the inclusion of Ajantha Mendis over Rangana Herath in Galle, Sangakarra said Mendis did his job perfectly well. "I think Ajantha bowled very well in Galle. The perception is that he might not have looked as dangerous as he could be but I think he put an enormous amount of pressure on the batsmen not to play strokes. The one stroke that Jacob Oram played got him out and the rest had to hang in there and wait, defending Mendis, and that put a lot of pressure on each other." Sri Lanka are not risking Angelo Mathews, who sustained a hamstring strain in Galle, which leaves a very significant No 6 void to be filled. 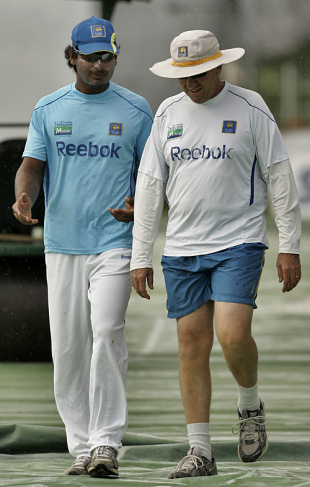 Sangakkara said the man to step in would be Chamara Kapugedera, who'd play his eighth Test. Sri Lanka would prefer three spinners but without Mathews that doesn't really give them the option. "Kapugedera is going to be a variable player coming in after runs in the warm-up games, plus the good nick he's been in recently [in ODIs]. We'd like him to get an opportunity after the 96 he got against Bangladesh [in his most recent Test in January]."